In Madrid, Prof. Michel Rosenfeld (right) joined Juan Jose Lucas Gimenez, second vice president, Spanish Senate, at the 25th anniversary celebration of the Spanish Constitution. Jan 13, 2005 — The academic year ended on an extremely high note for Michel Rosenfeld when he received word that on June 4, 2004 French President Jacques Chirac signed a decree awarding the Cardozo professor the Legion of Honor, the French government’s highest and most prestigious award. It was bestowed in recognition of Rosenfeld’s outstanding contribution as a legal scholar and his keen interest in French law and culture. Each year about 10 Americans are recognized as Knights of the Order of the Legion of Honor, founded by Napoleon I in 1802. Past recipients include Ronald Reagan, Colin Powell, Neil Armstrong, Gregory Peck, Robert De Niro, and Estée Lauder. Awards to foreign academics are exceedingly rare. Rosenfeld will formally receive the honor on March 8, 2005 at the French Conuslate in New York. This award capped a year of triumph for Rosenfeld. In January, prior to stepping down as president of the International Association of Constitutional Law (IACL), a position he had held for five years, he was honored in Santiago, Chile, where he received the key to the city from the mayor and became an honorary citizen. He was in the Latin American country to preside over the Sixth World Congress of IACL, making an address before the Senate, attended by government officials, diplomats, and more than 500 Association participants from 62 countries. He spoke about the new challenges facing constitutional law in the 21st century as countries deal with the issues of terrorism and globalization and those countries new to democracy let go of autocratic regimes and systems. 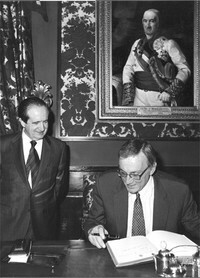 His proficiency in several languages was on display as he responded to the Vice President of Chile and the head of the Senate in Spanish, read a letter from former President Giscard d’Estaing and responded and spoke on transnational constitutions in French, and gave his address in English. During the Congress, Chilean President Ricardo Lagos hosted Rosenfeld at a luncheon at the National Palace. between Justices Breyer and Scalia on using foreign jurisprudence in US constitutional decisions. Rosenfeld, a leading expert in comparative constitutionalism, believes that the US Supreme Court should look to international court decisions when deciding difficult cases. Professor Rosenfeld also serves as editor-in-chief of the International Journal of Constitutional Law, I•CON. In that role, he was co-organizer and a panelist at Altneuland: The Constitution of Europe in an American Perspective, sponsored by NYU School of Law and the Woodrow Wilson School of Public and International Affairs at Princeton University. He also spoke in Paris at a symposium on Equality and Justice: American and French Perspectives, organized by the University of Paris X and American University Washington College of Law, and lectured to graduate students at the University of Paris I. Later he gave faculty seminars at the Universidad Autonoma de Madrid Law School and University College in London, and taught courses on Comparative Constitutional Equality at the Central European University in Budapest and on the Theory of Political Rights at the European University Institute in Florence.